Russia’s one-year ban on agricultural imports prompts U.S. chicken farmers to seek out new markets. Call it the Chicken War. Russia, the second-leading market for U.S. poultry sales, has barred American birds from the nation’s grocery aisles for a year in retaliation for Western economic sanctions against the country’s financial and energy industries. Chicken has long been one of the most important trade items between the two former Cold War adversaries, which have relatively small amounts of trade. Today, Russia accounts for some 7 percent of U.S. poultry exports. The ban sent U.S. vendors scrambling to secure new markets and prompted Russian retailers to look elsewhere for supplies. Yet industry experts said the move has less impact today than it would have had in years past, when Russia imported as much as 40 percent of U.S. poultry exports. Russian industry experts said the move will likely have a limited impact on the country’s consumers as well. Russian farmers have won a greater share of domestic sales over the past few years by emphasizing the higher quality of refrigerated chicken meat over frozen imports, which are easier to transport from abroad. In 2000, Russia relied on imports for about half of its chicken consumption. That figure has since fallen to 10 percent, according to Musheg Mamikoyan, Head of the Russian Meat Union. Russian chicken farmers, likewise, pledged to make up for any shortfall. “Dependence on American chicken meat is insignificant,” said Alexander Kostikov, communications director of the Cherkizovo Group, one of Russia’s major poultry and pork producers. Kostikov said Russia currently produces about four million tons of poultry annually for a market that consumes about 4.4 million tons. The country imports roughly 360,000 tons annually, out of which 100,000 tons come from the U.S., according to Kostikov. The ban on U.S. chickens is part of a spiraling international dispute over the unrest in Ukraine, in which Europe and the U.S. have sought to inflict economic penalties on Russia. Moscow, meanwhile, has struck back with its own measures. On Aug. 7, the Russian government introduced an embargo on agricultural products imported from the EU, the U.S., Norway, Canada and other countries that have imposed sanctions against Russia, impacting a total of about 10 percent of Russia’s $40 billion worth of agricultural imports. For American producers, the embargo first and foremost concerns chicken. Russia has put temporary limitations on U.S. poultry exports in the past, including during what was at the time dubbed the “Poultry War” of 2002, when Russia temporarily cut U.S. poultry imports in response to American steel tariffs. 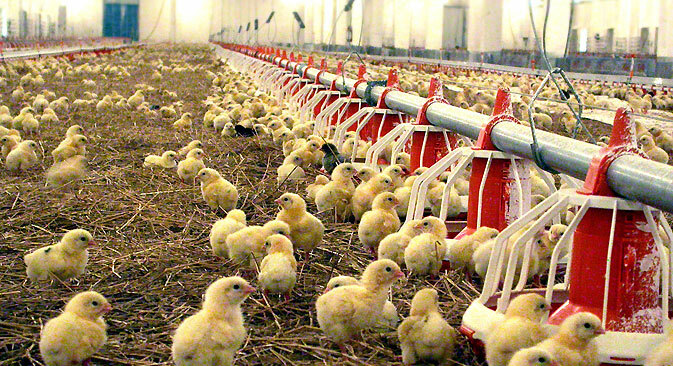 Ilya Balakirev, chief analyst at the UFS invesment company, said that new investments in capacity have raised the output of Russia’s chicken farmers to the point where the country should be able to produce enough chicken meat for domestic demand. Balakirev also pointed out that the reduction in supply can be offset by an increase in imports from other countries, such as Brazil, which is a significant supplier of chicken meat to Russia, with approximately 10 percent of the market. Other major suppliers include Belorussia and Kazakhstan, from which Russian receives 15-20 percent of its poultry imports. Authorities in Moscow have likewise allowed Turkish firms to increase dairy exports to Russia. The U.S. and Europe began introducing sanctions against Russia following allegations that Moscow has been giving military support to rebels in eastern Ukraine and massing troops near Ukraine’s border. The Kremlin denied the charges, while accusing western countries of supporting a coup in Ukraine last year that ousted the democratically elected president, Viktor Yanukovych.